The Vase Table was a breakthrough for me in combining other industrial processes together with terrazzo. These processes were aluminum spinning and aluminum sand casting. I had little knowledge of these processes prior to designing the Vase Table. I made the Vase Table in 1994. The circular terrazzo top is 19-1/2 inches in diameter, enclosed by a polished spun aluminum rim. The terrazzo is divided into quadrants by aluminum cloissons, or divider strips. Each cloisson includes an aluminum diamond that is filled, intarsia-like, with green marble. The polished terrazzo is crushed Italian Rosso Verona marble, in an earth-red cement matrix. 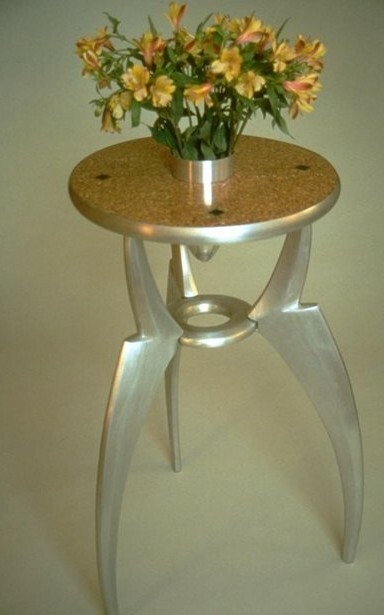 The center of the table has a four-inch hole to accommodate the tapered and polished aluminum vase that penetrates it. The substantial base is a tripod made of solid cast aluminum. Each leg is nicely proportioned with shapely curves, attached to a central ring. The whole base was ground and polished by hand prior to being assembled and welded together. In 1993 I learned of a metal spinning operation located in Long Island City, Queens, called Gem Metal Spinning and Stamping. I visited them. The first signs of gentrification of this manufacturing area were starting to appear. Twenty years later, there are many super-block luxury high-rise buildings adjacent to Gem Metal’s location, which is now closed. My first visit to Gem Metal showed a sizeable and well-equipped plant that looked forlorn and vacant. Its owner, Steve, inherited the factory from his parents, who presided over its now-vanished industrial heyday. The holloware they produced was used as components for the lighting industry. Their peak was decades before my appearance. Steve grew up in the business and was just trying to hang on and meet costs. He told me he hoped to sell out to a real estate developer. He kept a skeleton crew and did small, limited-run jobs for designers like me. A sizeable locker room and huge industrial hand washing sink spoke of an earlier workforce of many employees. It was now ghostly. Steve toured me around, showing me machines and explaining processes. I looked around at samples of spun aluminum shapes and the collection of hardwood forms used to make them. It all looked kitschy and uninteresting, a 1950’s sensibility. I asked to see his garbage. Out back in drums for recycling, I found an aluminum rim and a nicely shaped vase. I placed the vase inside the rim, and voila’ the Vase Table was born. I met Steve’s minimum order for multiples of rims and vases, and set about designing the rest of the Vase Table in earnest. Aluminum spinning uses a motorized lathe. Circular blanks are cut from sheet stock. The blanks are centered on the motor’s spindle and clamped against the chosen hardwood form. A large harpoon-like tool is levered against the spinning blank and gradually worked into the blank until it conforms to the desired shape. Some grease is used. The same process applies for brass spinning, but brass must be annealed afterwards in an oven. A fellow designer told me of a foundry in Brooklyn—J&J Bronze and Aluminum Casting on Huron Street. I did not know that they were the last foundry in New York City. I visited them, and they showed me around and explained their process, sand casting. Essentially I had to carve in wood the patterns I wanted to cast. They had to be made in two pieces that joined together in the middle with dowels so that there would be good registration when casting. They had to be tapered so they could easily separate from the mold. I sketched a great number of possible base designs until I came up with a leg that I found appealing. I then sculpted several scale-model legs out of extruded polystyrene, before settling on an exquisitely shaped leg. Next, the full size two-piece patterns for casting were carved. Lastly, the two-piece ring that would connect the legs in the center was carved. A ring of flat aluminum plate would connect the legs on the top. I brought my patterns back to the foundry, which was humming with activity. They attached the patterns to a plywood match plate which would be pressed into the special sand they used for casting. The sand was in two halves of a rigid flask which was later bolted together. My patterns were painted with a heat-resistant paint. 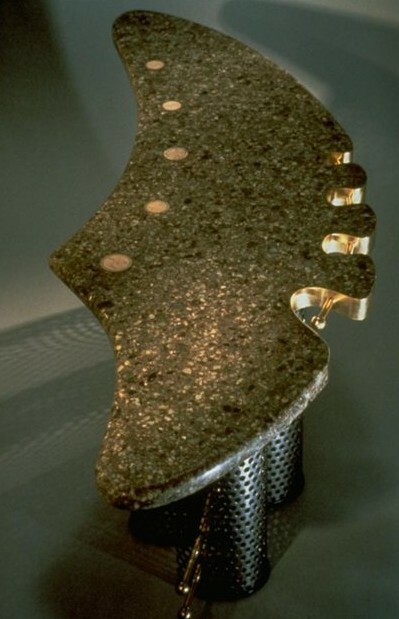 They added material to provide pathways for the molten metal to flow into the negative spaces created in the mold. This is called the gating system. J&J’s mold maker added a riser which creates a void to allow extra material that offsets shrinkage during cooling. They added a sprue, the vertical part of the gating system. One end connects to the pouring cup where molten metal enters the mold; and the other end connects the runners to the gates which control the flow of molten metal. After casting, I collected my order. The castings had a rough texture and were not at all smooth. Some fine amounts of metal came out at the seams. This was called flash, which they cut off with a band saw. I ground the castings on a drum sander using increasingly finer grits until they were smooth and polished. I made a jig to clamp the three legs and center ring in position, and then had them welded together. The Vase Table is a tribute to vanishing New York industries–and a design I will always be proud of.